Using up leftovers is a rarely an issue in my house, and yet sometimes a recipe looks so good that — even if it’s billed as a way to use up leftovers — I try it out. That’s how I discovered our new favorite winter holiday cookie (the cranberry thumbprint), for which I made an extra batch of cranberry sauce, and now so it is with my new favorite snack pancake. I don’t know about you, but in our house, pancakes are definitely not just for breakfast. In fact, we frequently rely on extra (or leftover) pancakes as a quick after school snack. This recipe is perfect for that, since it makes a sturdy little pancake that holds up well to snack bags and backpacks, plain or layered with peanut butter and apple slices. The original recipe calls for cooked quinoa; I regularly cook rice and quinoa together for our dinners, so I used that leftover combination. I expect a cup of plain brown rice would work nicely, too. Also, the original recipe calls for an egg + an egg white, but a single egg yolk is not a leftover I generally use efficiently (egg wash, anyone?) so two whole eggs works just fine, too. 1. In a medium bowl, whisk together quinoa, flour, baking powder, and salt. In another medium bowl, whisk together egg, egg white, butter, milk, and syrup until smooth. Add egg mixture to flour mixture and whisk to combine. 2. Lightly coat a large nonstick skillet or griddle with butter and heat over medium-high. Drop batter by heaping tablespoonfuls into skillet. Cook until bubbles appear on top, 2 minutes. 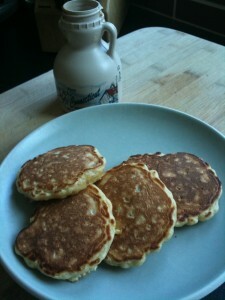 Flip cakes and cook until golden brown on underside, 2 minutes. Wipe skillet clean and repeat with more melted butter and remaining batter (reduce heat to medium if overbrowning). Serve with maple syrup and fresh fruit or preserves if desired.